Reported sales were down 9% year-on-year to SEK 43.4 billion, but only down 2% when the usual handy currency adjustments kick in. 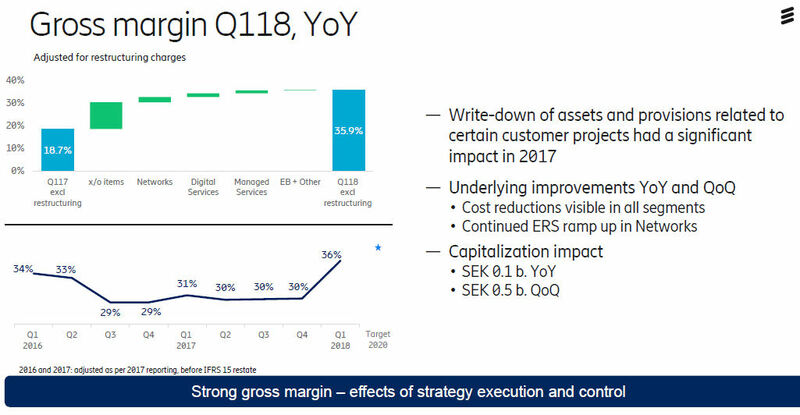 While it’s a shame to see yet another quarter of decline, it was more or less expected and Ericsson has previously stated its immediate priority is profitability rather than growth. 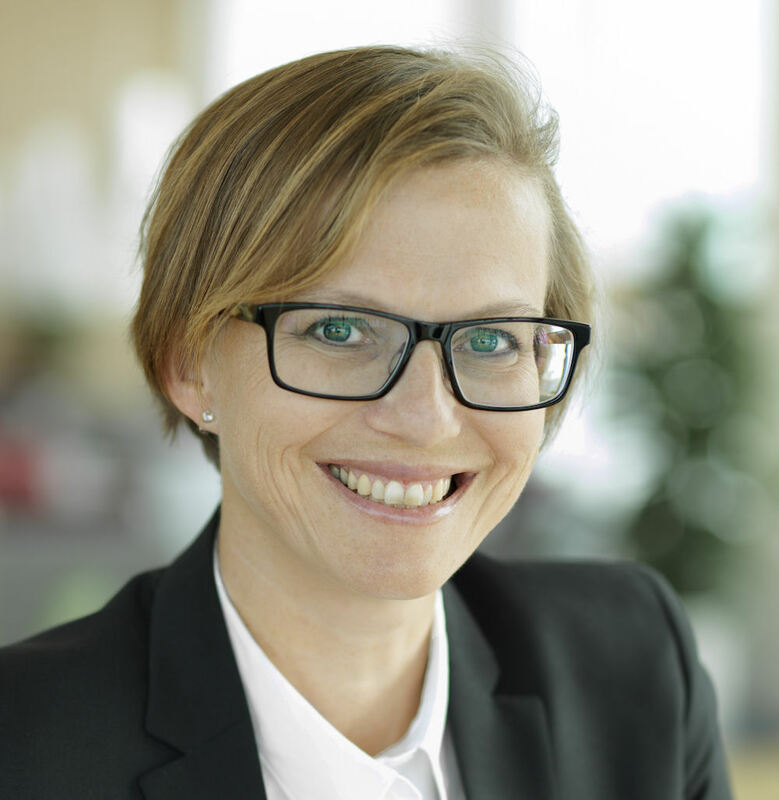 To get a bit more insight into the results Telecoms.com spoke to Helena Norrman, SVP and Head of Marketing and Corporate Relations at Ericsson (pictured). 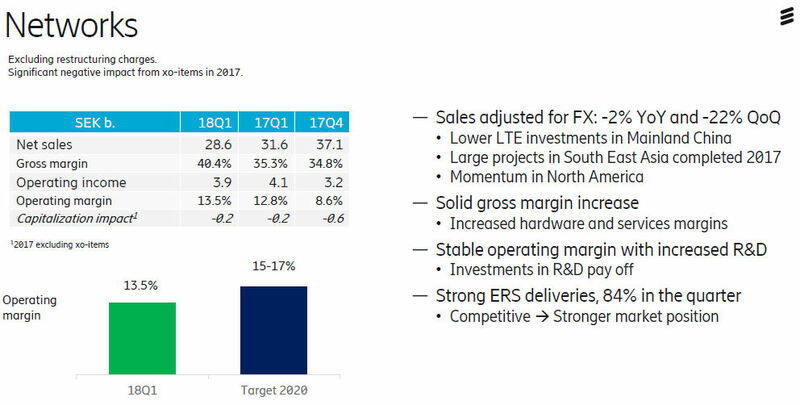 In line with the above strategy Norman was keen to highlight Ericsson’s trend of improving gross margin, which jumped to 34% in Q1 2018, up from 16% a year ago. 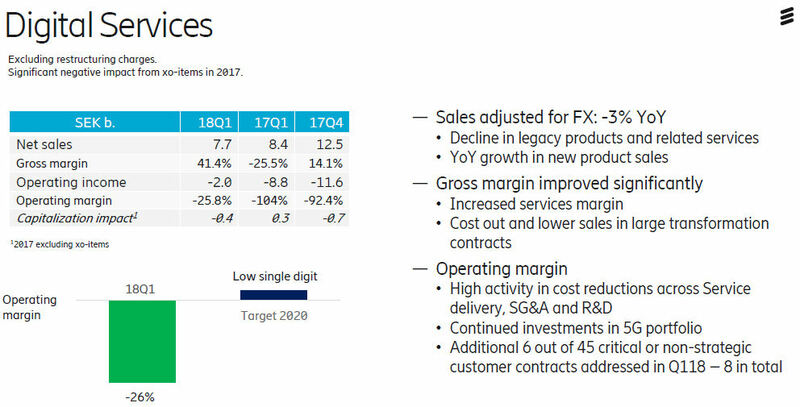 She explained that the like-for-like jump isn’t quite as dramatic as that, thanks to a bunch of exceptional items and IFRS changes and pointed us towards the slide from Ericsson’s presentation below, which shows that the adjusted gross margin for this quarter was 36% and was 31% a year ago. 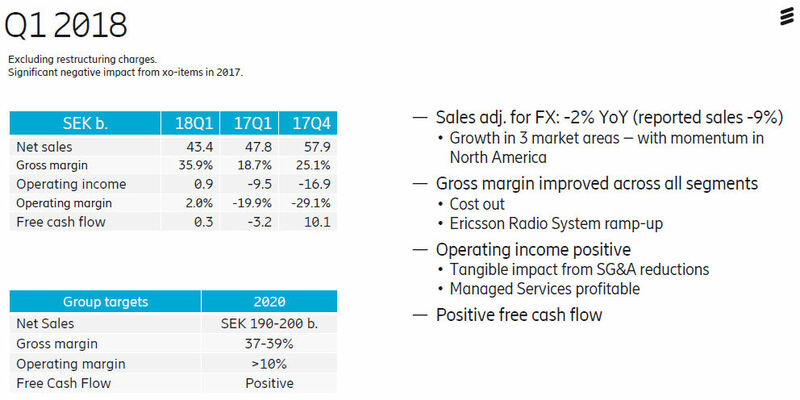 Either way gross margin, which is probably Ericsson’s number one priority right now, seems to be headed in the right direction, for which Norman expressed satisfaction. The reasons for this improvement are fairly well-known. Norman advised that around half of it is down to the streamlining process that has been underway for some time now. The rest of it is down to getting out of bad contracts and, on a more positive note, increased sales of Ericsson Radio System. Norman, and every other Ericsson exec we’ve spoken to in the past few quarters, are quick to admit there’s still a long way to go. 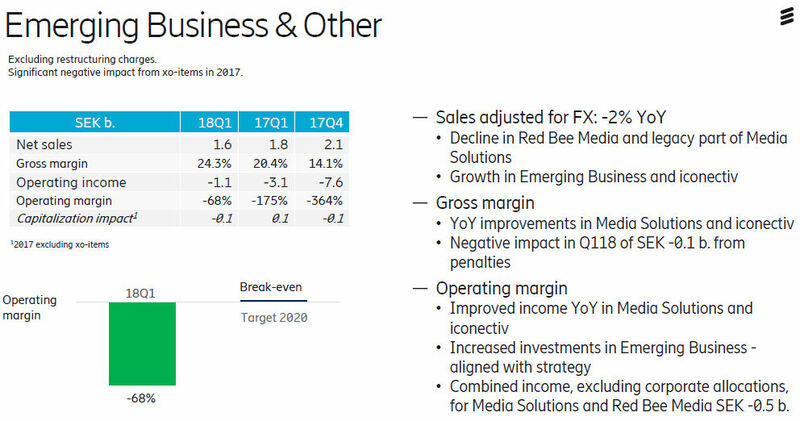 Of course the trend of revenue declines needs to reverse, but the cunning plan is to stop losing money first, which is reasonable, and datapoint trends like improving gross margin are viable causes for muted celebration. Ericsson has gone through a few years to facing up to its own corporate dysfunction and is trying to build a robust platform from which to rebuild. When we asked Norman if she was feeling optimistic she confessed to a degree of “Scandinavian optimism”, which seems to be of the quiet, cautious variety. As in the UK, spring has finally arrived in Sweden and Ericsson may allow itself a cheeky glass of aquavit in the sun this weekend, before rolling its sleeves up once more on Monday. A share price jump of 17% at time of writing will presumably add to the high spirits. Here are some other selected slides from the Ericsson Q1 2018 presentation.